On the night Johann Galle first spotted Neptune in 1846, it was in the constellation Aquarius close to the planet Saturn as seen here. Tonight the planet Neptune completes its first trip around the sun since humans first discovered the gas giant planet. Neptune is the only planet to have been discovered by mathematics. French astronomer Urbain Le Verrier noticed irregularities in the motions of other planets, and from these perturbations calculated that there must be an eighth planet lurking out beyond Uranus. Using Le Verrier’s calculations, German astronomer Johann Galle at the Berlin Observatory located the new planet on Sept. 23, 1846. Neptune's orbit is shaped roughly like an oval, with the planet taking about 165 years to complete a single circuit. The average distance between Neptune and the sun is nearly 2.8 billion miles (4.5 billion kilometers). That's roughly 30 times as far away as Earth. 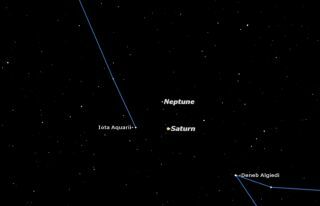 On the night Galle discovered Neptune, it was just north of the planet Saturn in the constellation Aquarius. Tonight Neptune is back in Aquarius. The sky maps available here show how Neptune appeared to astronomers when it was first seen in 1846, as well as how it appears tonight. Tonight marks exactly one Neptunian year, 165.6 Earth years, later, and Neptune has returned to Aquarius. Saturn is currently in Virgo, on the other side of the sky as seen here. Why does Neptune appear to be in a different position tonight than it was in 1846? The answer is complicated and has been explained by Peter Jedicke of the Royal Astronomical Society of Canada. Writing in the RASC "Observer’s Handbook 2011," Jedicke explains that he used the International Celestial Reference Frame to determine that Neptune returns to the exact point in its orbit where it was discovered tonight at 22:27 Universal Time, or 6:27 p.m. Eastern Daylight Time.